The call was very clear, here were “four demands” for Paris COP21 being presented to a group in London. But the surprise was the presenter; not a climate focussed NGO or an activist campaigning for change, but Fatih Birol, Chief Economist for the International Energy Agency. He was in an optimistic mood, despite the previous two weeks of ADP negotiations in Bonn that saw almost nothing happen. He opened the presentation by saying “This time it will work” (i.e. Paris, vs. Copenhagen and all the other false starts). On June 15th Mr Birol launched the World Energy Outlook Special Report: Energy and Climate Change. The IEA usually launch a special supplement to their annual World Energy Outlook (WEO) and this one was the second to focus on the climate challenge and the policy changes required for the world to be on a 2°C emissions pathway. It was also something of a shot over the bow for the Paris COP21 process which had just completed another two weeks of negotiations in Bonn, but with little to show for the effort. Mr Birol is a master of such presentations and this one was memorable. He focussed almost entirely on the short term, although the publication itself looks forward to 2030 for the most part. With regards to the energy system, short term usually means 5 years or so, but in this case short term really meant December but with the resulting actions being very relevant for the period 2016-2020. High efficiency coal, both in new building and removing some existing facilities. IEA proposed a ban on building sub-critical coal. An even bigger push on renewable energy, with an increase in investment from $270 billion in 2014 to $400 billion in 2030. Oil and gas industry to reduce upstream methane emissions. Phasing out fossil-fuel subsidies to end-users by 2030. Implement a five year review process for NDCs (Nationally Determined Contributions) so that they can be rapidly adjusted to changing circumstances. I discussed the risk of a slow review process when MIT released a report on the possible COP21 outcome. Turn the global 2°C goal into clear emission reduction targets, both longer term and consistent shorter term goals. Track the transition – i.e. track the delivery of NDCs and transparently show how the global emissions pathway is developing as a result. Interestingly Mr. Birol didn’t mention carbon pricing once, at least not until a question came up asking why he hadn’t mentioned carbon pricing – “Is carbon pricing no longer an important goal, you didn’t mention it?” asked a curious member of those assembled at the Foreign Office. He said yes it was, but given his focus was on Paris and that he saw little chance of a global approach on carbon pricing being agreed in that time-span, he didn’t mention it! I think this represents a major oversight on the part of the IEA although there is at least some discussion on carbon pricing in the publication. While it is true that a globally harmonised approach to carbon pricing won’t be in place in the near term, I would argue that an essential 5th pillar (or 5th demand) for Paris is recognition of the importance of carbon pricing and creation of the necessary space for linking of heterogeneous systems to take place. This looks like the fastest route towards a globally relevant price. Mr. Birol didn’t mention CCS either, which is perhaps more understandable given the 5 year focus of much of the publication. 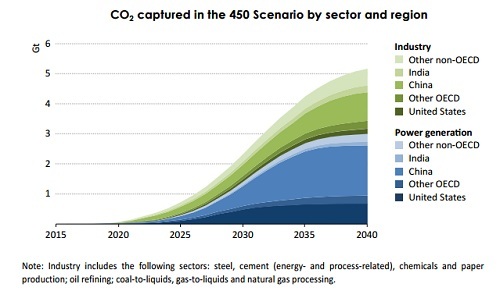 However, Chapter 4 within the publication deals extensively with CCS and the IEA highlights the importance of CCS in their 450 ppm scenario through the chart below. My reading of this is that the G7 are recognizing the need to be at or nearing global net zero emissions by 2100. However, this isn’t how the statement has been reported, with several commentators, media outlets and even one of the presenters alongside Fatih Birol interpreting this as an agreement to be fossil fuel free by 2100. These are two very different outcomes for the energy system; the first one potentially feasible and the second being rather unlikely. Both the Shell Oceans and Mountains New Lens Scenarios illustrate how a net zero emissions world can potentially evolve, with extensive use of CCS making room for continued use of fossil fuels in various applications. The core driver here will be the economics of the energy system and the competitiveness of fossil fuels and alternatives across the full spectrum of needs. It is already clear that alternative energy sources such as solar PV will be very competitive and could well account for a significant proportion of global electricity provision. Equally, there are areas where fossil fuels will be very difficult to displace; I gave one such example in a case study I posted recently on aviation. Energy demand in certain sectors may well be met by fossil fuels for all of this century, either with direct use of CCS to deal with the emissions or, as illustrated in the IPCC 5th Assessment Report, offset by bio-energy and CCS (BECCS) elsewhere. Unfortunately the nuances of this issue didn’t make it into the IEA presentation. That’s it from me for a couple of weeks or so. I am heading north on the National Geographic Explorer to see the Arctic wilderness of Svalbard and Greenland. Hello David. Hope you enjoy the trip to the North! I have a question and a comment to this post. Question: A constant confusion for me is that around net zero emissions. If the G7 commit to 70% (lets say) reduction by 2050 compared to 2010, I am trying to calculate the emissions in 2050. Assuming 30 Gt CO2 emissions in 2010, it means 9 Gt in 2050. Doesn’t that mean net zero emissions soon after 2050 (and not 2100) – as net zero means something around 7 Gt pa, on which you have dedicated post. Shiv; in my view “net zero emissions” means just that – something pretty close to zero. In the other post I was explaining different ways in which you could look at the numbers. As for 2050, that number has shifted constantly over the years, in large part due to a shifting baseline. Originally it was 50% below 1990 levels, which is very low indeed given where we are now compared to 1990.